The Orlando Magic selected center Dwight Howard with the top overall pick in the 2004 NBA Draft. Howard came to the NBA right out of high school after being named the Naismith Prep Player of the Year. Howard went on to start all 82 games during his rookie season. He would win the first of several Defensive Player of the Year awards in 2009. Howard was one of eight players selected directly out of high school in the 2004 NBA Draft. With the second overall pick in the 2004 NBA Draft, the Charlotte Bobcats selected UConn big man Emeka Okafor. The Chicago Bulls took Okafor’s UConn teammate and guard Ben Gordon at number three. The Los Angeles Clippers selected guard Shaun Livingston with the fourth overall pick, while the Washington Wizards took guard Devin Harris to round out the top five. 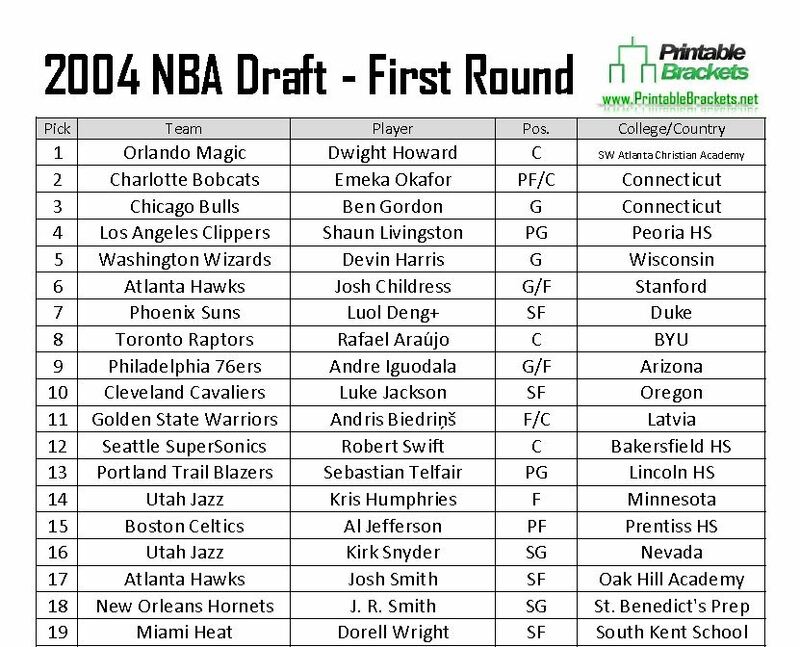 Other notable players taken in the first round of the 2004 NBA Draft include Kris Humphries, Al Jefferson, J.R. Smith, Jameer Nelson, Tony Allen and Delonte West. The Minnesota Timberwolves had to forfeit their first round pick due to salary cap violations. Okafor took home Rookie of the Year honors for the 2004-05 NBA season. Okafor, Howard, Gordon, Iguodala and Deng were named to the league’s All-Rookie team. Some notable players that were taken in the second round of the 2004 NBA Draft include Anderson Varejao, Chris Duhon and Trevor Ariza. The most notable player that wasn’t taken in the 2004 NBA Draft was Hamed Haddadi, who is the first-ever Iranian-born player to get minutes in an NBA game.